I'm sure you are all familiar with that token restaurant located in a business park or plaza. You know, the one that services all the hungry workers nearby who either a) don't have enough time to go somewhere far for lunch or b) are too lazy to go anywhere else. Many of them are only open for lunch and furthermore, are pretty unexciting (think Sandwich Tree). There are some that are bucking the trend and offering something a bit different such as 2 Chefs Richmond. Yet most go about their business relying on the local lunch crowd. 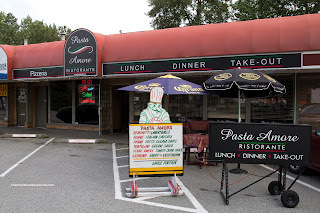 So for the longest time, I thought Pasta Amore was one of these lunchtime spots. But wait a minute, it is actually open for dinner... Looking on the net, there was next-to-nothing about the place. I needed to satisfy my curiosity, just like my curiosity as to why is Justin Bieber so popular... 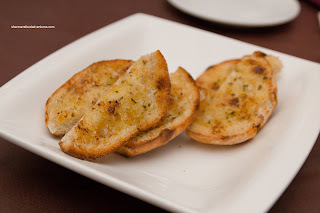 Hence, we grabbed the kiddies and convinced them that they wanted Italian food for dinner. Despite looking like any other industrial park restaurant, the inside of Pasta Amore is relatively decent. As we walked in, the staff (looks like a family-run place) warmly greeted and felt welcomed. We started with an order of the Garlic Bread and the kiddies loved it. It was crisp, garlicky and not overly greasy. However, it was a bit small for the price though. For our pasta dish, at my son's request, we got the Penne Claudio. 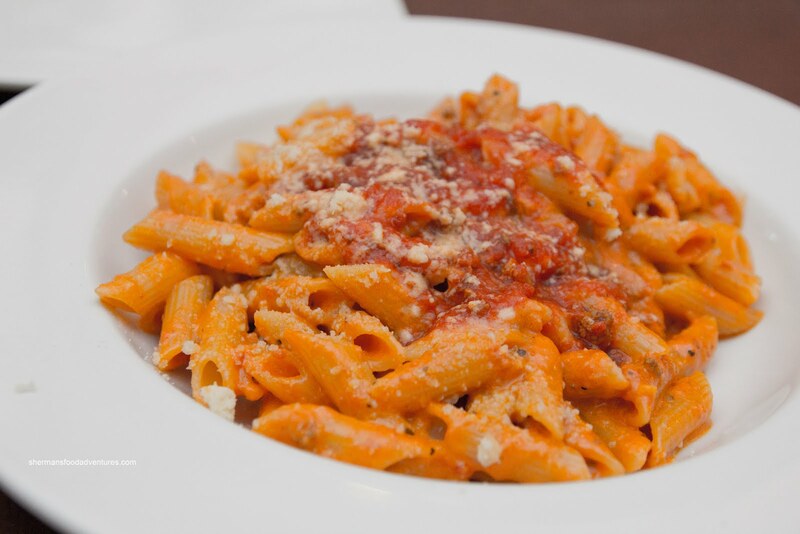 This was made with a creamy tomato meat sauce which was balanced and there was just enough clinging onto the penne. The penne itself was al dente. My son gobbled up this willingly and that in itself meant it was good. In fact, we liked it too. We decided to try on of their pizzas with the Funghi, which had pepperoni on it as well. For this type of thin-crust pizza, it was above-average. The crust was crunchy and nicely charred while the tomato sauce was light. There were plenty of mushrooms and large slices of pepperoni on top. 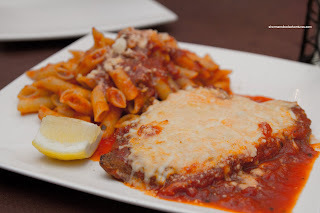 Trying to sample an item from each section, we also got the Veal Parmigiana with a side of penne. We liked how the veal was an actual piece of meat rather than a cutlet. It was moist, tender and crisp on the outside. There was just enough tart tomato sauce on top with a nice layer of baked Mozza/Parm on top. The side of penne was al dente with a pretty typical tomato-based meat sauce. At the end, they were even nice enough to send out a little treat for the kiddies in the form of homemade ice cream. As you can already tell, we were hooked with the excellent and personable service. The food itself was okay considering that our expectations weren't very high. This is classic example how a good attitude and genuine care about the customer can elevate a dining experience. You took your family to dinner in a business park/plaza ?!? Bad daddy !! Actually it's not so bad, Dawson is only 1 block from Brentwood Town Centre, an area with a dearth of good eats actually, unless you head up to Hastings between Willingdon and Boundary. Or the new Cotto Enoteca. If you liked this place in 2012 you should definitely go back now! They recently changed their pizza because they hired a new pizza chef right from Italy and it is AMAZING. 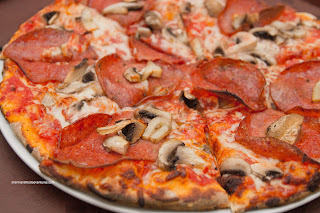 Best pizza in Burnaby by far.